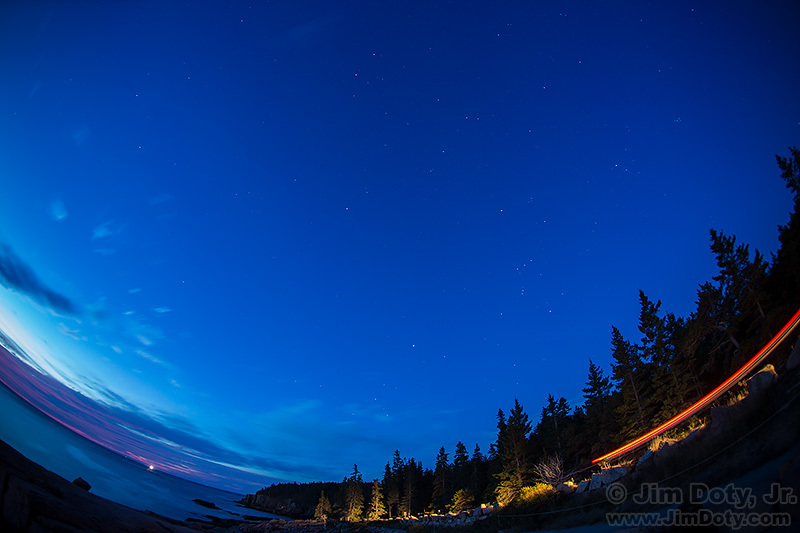 Stars over Otter Cliff, Acadia National Park, Maine. October 20, 2018. Click for a larger version. My “favorite photos” folder covers 30 plus years of photography, but all but two of my favorite photos for October 20 were taken the same day in Acadia National Park. The day began very early. The guide books said arrive early to get a parking space (or walk over a mile to get where you want to be) so I arrived at my preferred parking lot near Otter Cliff an hour and 15 minutes before sunrise. I thought I would be the first car there. I was wrong. I was the fourth car to arrive and while I was getting my gear our of the car more cars arrived. The lot only held about 10 cars. I bet the small parking lot was full an hour before sunrise. I started taking pictures in the pre-dawn light. My favorite photo for the day was taken while the stars were still out. I used a 15mm semi-fisheye lens to take in as much of the sky as possible. The curved horizon is typical of a fisheye lens if the horizon doesn’t run right through the middle of the frame. 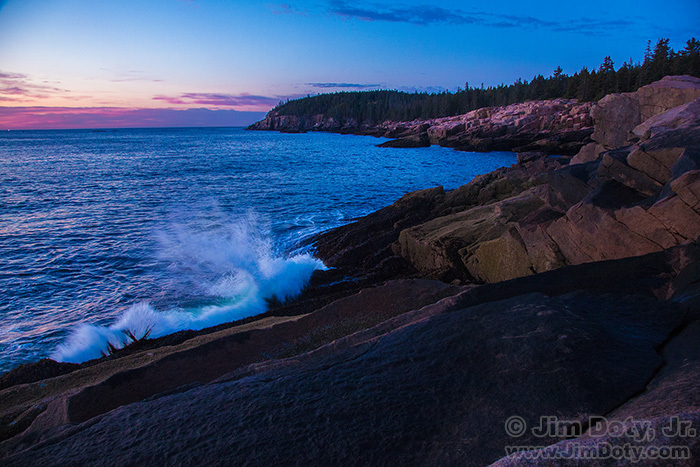 Waves at Otter Cliff, Acadia National Park, Maine. October 20, 2017. The light was still beautiful as the first hints of early morning light hit the granite ledges. Waves were breaking on the rocks and somewhat blurred due to the long exposures. This is my second favorite photo for the day. Sunlight at Otter Cliff, Acadia National Park, Maine. October 20, 2017. I stayed until sunlight finally hit the granite ledges. Then I wandered the park roads in search of fall color. 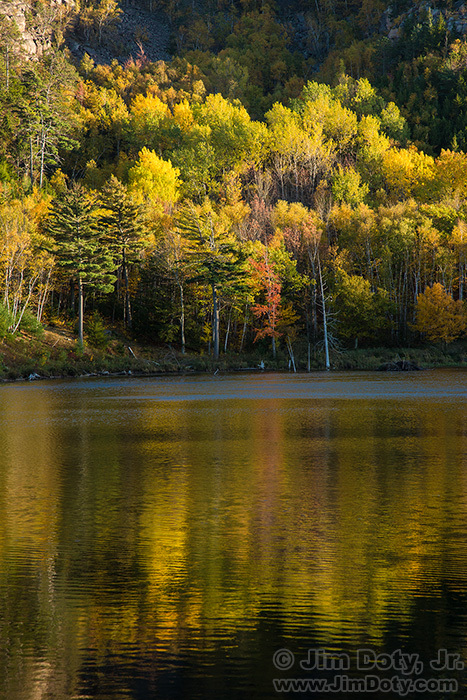 Beaver Dam Pond, Acadia National Park, Maine. October 20, 2017. 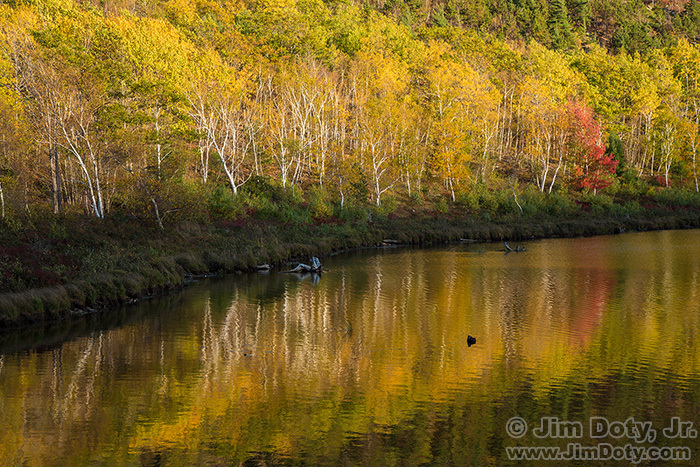 Beaver Dam Pond is a nice photo location, especially if you can get some reflections. A little bit of breeze is fine. A strong wind and the reflections are pretty much gone. South Bubble Mountain, Acadia National Park, Maine. October 20, 2017. 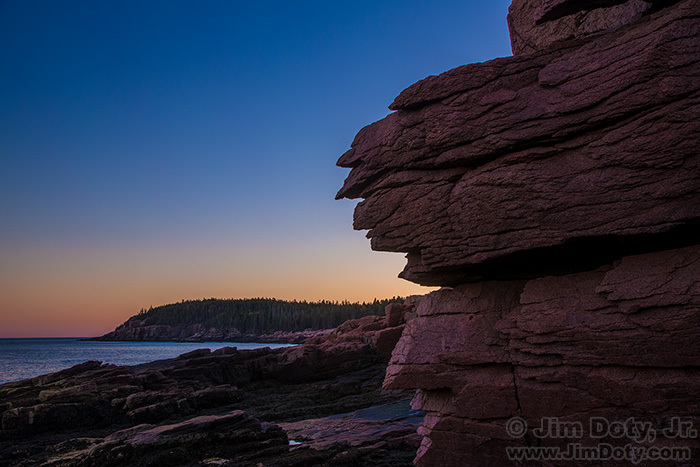 Twilight at Otter Cliff from Thunder Hole, Maine. October 20, 2017. 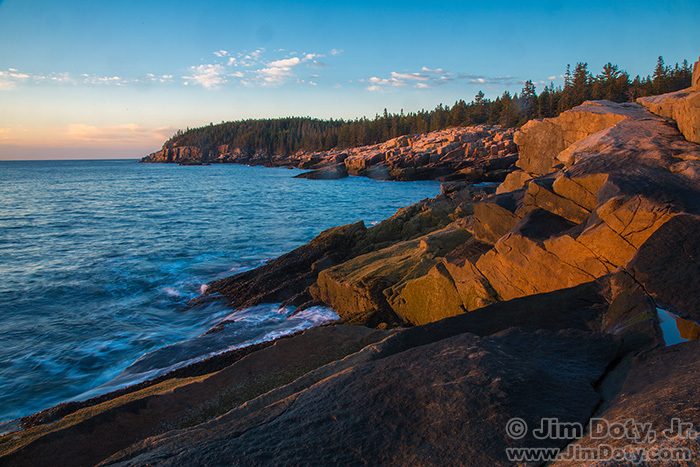 I came back to the Otter Cliff area in the evening and stopped at Thunder Hole to catch the last light on the rocks. I loved the famous “WHUMP” sound as waves rushed into Thunder Hole and were constricted at the narrow end. In the evening and at night you will pretty much have Otter Cliff to yourself. Milky Way and Otter Cliff from Thunder Hole, Acadia National Park, Maine. October 20, 2017. 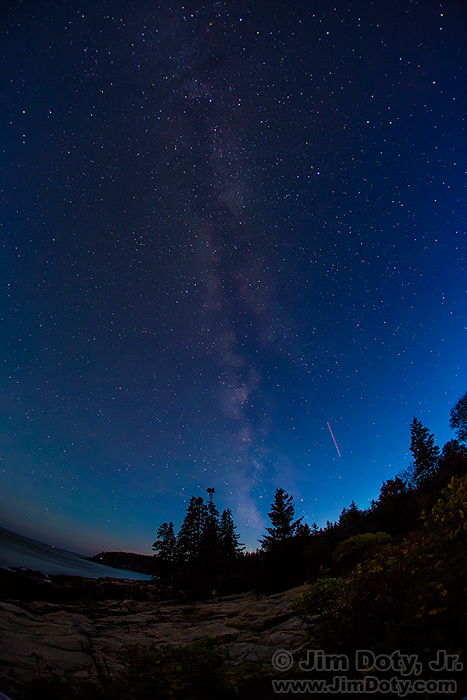 I stayed at Otter Cliff long enough for the Milky Way to become visible. This is my third place favorite photo for October 20. Otter Cliff is mostly a morning location. 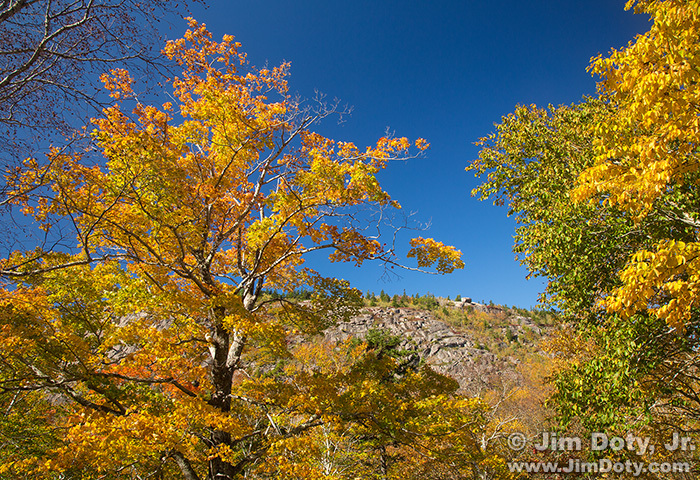 The park is hugely popular in the summer around the peak fall color season in mid October. The guide books are right, arrive early at Otter Cliff if you want a parking space that isn’t a mile or more from where you want to be. Check out the Otter Cliff area in the afternoon when most tourists and photographers are elsewhere. Decide the area you like best and pick your parking lot accordingly. Then arrive at that parking lot the next morning while the stars are still out. The drive along Otter Cliff is one way and if you miss your spot it will take you about 45 minutes to make the loop and get back to the same spot again, so it pays to know ahead of time where you want to be.